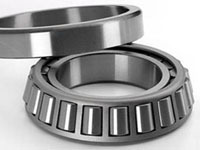 Tapered roller bearings have tapered inner and outer ring raceways and tapered rollers arranged in between. Conical surface of the projection lines of all are the same point on the bearing axis together. Tapered roller bearings are mainly exposed to the radial diameter, axial load. Load carrying capacity depends on the angle of the outer ring raceway, the greater the angle the greater the carrying capacity. Tapered roller bearings are widely used in automotive, mill, mining, metallurgy, plastics and machinery.